Proportionate liability regimes have been operational in various forms for almost 20 years and the scope and effect of those regimes have, after considerable judicial attention, been largely settled. Nevertheless, there remains one crucial question still to be determined by the Courts which continues to plague litigants: can a claim for damages made purely under contract (eg, under an indemnity) “arise from a failure to take reasonable care” thereby constituting an “apportionable claim”? This article analyses the judicial consideration of this question to date, in addition to weighing the merits of the contrasting approaches in light of the words and purpose of the statutes. This article concludes that the better view is that a claim made solely under contract cannot constitute an apportionable claim for the purposes of the proportionate liability regime, and that a plaintiff is entitled to pursue a sole defendant for damages under such an action. Project Testing and Commissioning is often the singularly critical event signalling the transitional phase from construction risk to operational risk. The factual and legal complexities around project completion and project handover on a site before, during and after testing and commissioning can often serve to confuse whether a project has, at law and under contract, in fact transitioned to operational status. The distinction though is an essential one, not just for risk financers, but for Principals who do not wish to bear the costs and delays of defects in workmanship, materials and processes of a Contractor, and for Contractors who do not wish to bear responsibility for operational concerns for plant effectively delivered. The testing and commissioning phase can represent a period of blurred lines as is demonstrated in the following article. 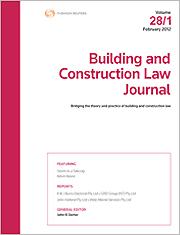 For the PDF version of the table of contents, click here: BCL Vol 34 No 1 Contents.